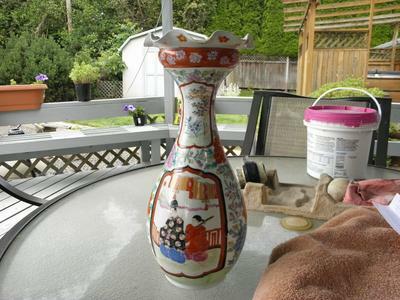 Hi Peter, I have a vase that I am trying to figure out what it says, after searching for a long time I think it says made by Fukagawa and the character on the right, I think it is Hizen but I am not sure, then I found some small characters on the vase itself, I know that you specialize in chinese porcelain but I am stumped, could you please help, thanks. 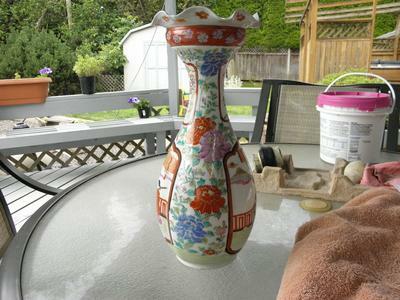 Hi Peter, thanks again for your professional opinion, I thought that to be strange myself, I found other marks very similar except on the right side this vase is missing two characters, this is clearly an older vase and hand throne and hand painted, it is older than two other vases that I have that have similar writing, I was hoping that it could be attributed to an earlier fukagawa name, I know there was a period around 1868 I believe that was when they first started signing their porcelain, the glaze on this vase is duller in appearance than the other two vases I have it not as shinny although it is quit nice, I am hoping that this can be authenticated as an early piece of fukagawa I will send you some more pictures to evaluate age, thanks again peter. Stan, this could be a fake, judging by the marks alone. But I have no way to make sure. 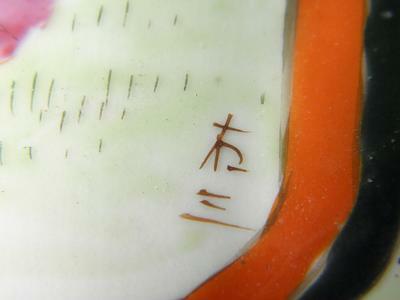 You will have to check other Fukagawa marks to verify the following. I have seen the two characters in your second picture before, but they are usually on the bottom. 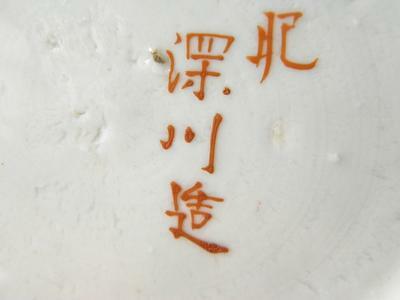 I believe it is a personal name, but not completely sure. Why should it be on the side and not on the bottom? Did they think it strange having two different marks on the bottom, but wanted to push the artisan's name? I have also issues with the maker's mark. The first character of "Fukagawa" has one stroke more than todays Japanese or Chinese have. Could be an older writing style or just sloppy writing, but not sure. The fourth (single) character should probably be the Hi of Hizen, but I do not know if the character was used alone. Again, it is written in a very sloppy manner, as is the third character (after Fukagawa). I only know that usually another character "san, zan" follows after "hi".